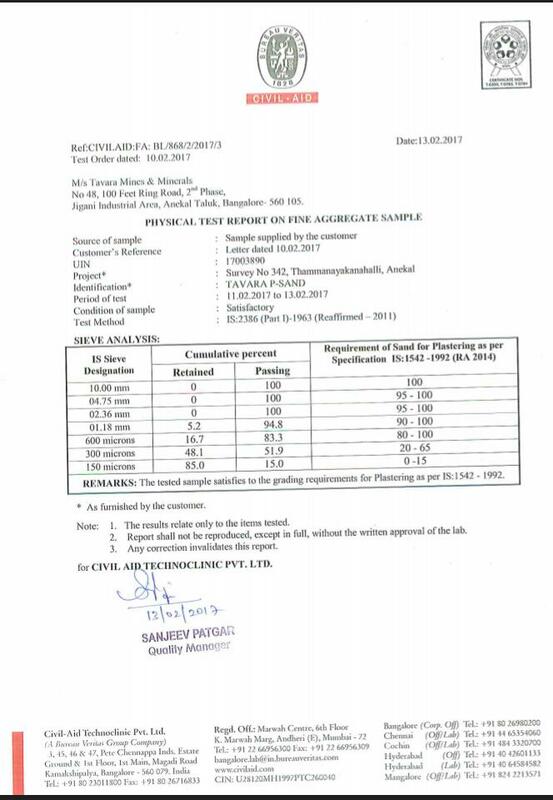 This standard covers the requirements of naturally occurring sands, crushed stone sands and crushed gravel sands used in mortars for internal wall and ceiling plastering, and external plastering using mixes of lime, cement, composite lime-cement, activated lime pozzolana mixture ( ALMP ) or gypsum with or without admixtures and sand. Manufactured Sand with the granule thickness of 0 - 2.36 mm is suitable for all kinds of plastering requirements and is used across all segments such as Independent Houses, Apartments and other Residential & Commercial Projects. Plastering sand does not require to be filtered again at the construction site and can be used directly to prepare the mortar which saves labor, time and money. The sand shall consist of natural sand, crushed stone sand or crushed gravel sand or a combination of any of these. The sand will be hard, durable, clean and free from adherent coatings and organic matter and shall not contain clay, silt and dust more than specified. Tavara uses strict conditions to ensure that our M Sand (Manufactured Sand) for Plastering does not contain any harmful impurities, such as, iron pyrites, alkalis, salts, coal, mica, shale or similar laminated materials, soft fragments, sea shells and organic impurities in the given quantities as to affect adversely the hardening, the strength, the durability of the appearance of the plaster or applies decoration, or to cause corrosion of metal lathing or other metal in contact with the plaster.